One of the strangest ancient sites in the world, Pumapunko, lies near Tiwanaku, the archeological site in Bolivia, south of Lake Titicaca, on the border of Peru and Bolivia. The site is less than a mile from Kalasasaya, a huge paved courtyard surrounded by a wall that is part of Tiwanaku which was designated a UNESCO World Heritage site in 2000. Pumapunko is a large earthen mound about 500 feet wide (167 meters) and about 350 feet in length (116 feet). What can be seen today is the remaining giant stones, some of which still lie scattered helter-skelter along the ground, and some of which have been lined up by archeological excavators in long rows. Radiocarbon dating of the mound-fill underneath the stonework has placed the first construction at the site to around 536 – 600 CE, but some researchers believe that Pumapunko is much, much older. The dating of nearby Tiwanaku is also a matter of considerable controversy. The most remarkable and strangest feature of Pumapunko is the extremely precise way in which some of the stones were cut, which suggests that they were shaped by a technologically advanced civilization using modern machine tools. Many of the corners, both outer and inner corners, have been broken over time, but the extraordinary perfect flatness of the stones’ surface can be clearly seen. There are rows of what are called H blocks. Massive stones shaped like the letter H. The surface of the stones is absolutely flat and smooth, cut to a tolerance of three 10,000th of an inch. The corners are precise right angles, with further right-angled rectangles indented inside the outside shapes, and even more rectangles inside those – not something that seems possible to do with a hammer and chisel. Cut into some of the stones so that they may be joined together are dovetail holes, with the inside of each indentation larger than the outside, so that the stones can be locked into place. In a YouTube video (the link is given below) Brien Foerster walks along a low wall uncovered during a recent excavation done in 2012. Among many sandstone rocks in the wall which are roughly shaped or natural are placed a few very hard gray andesite rocks, which stand out because of their very precisely cut, sharp lines. These andesite stones appear to have been recycled from earlier structures, perhaps from thousands of years ago. The sandstone rocks are primitively shaped, but the andesite rocks were made by someone else who possessed very advanced technology. Some of the remarkable H stones can also be seen in the video. The site is vast, with a huge array of amazing structures, at an altitude of 13,000 feet. It resembles nothing else on earth, and it is not easy to imagine who might have built it, or for what purpose. It has been suggested by some investigators that the stones must have been melted in some way and then formed in a mold; however, Brien Foerster points out that each stone is unique with slightly different measurements so they could not have been shaped in a mold. The largest foundation stone is not andesite, but red sandstone, which weighs 131 tons. It was moved uphill to the site from a quarry several miles away, but no one knows how. It could not have been rolled on logs because there are no trees here at this altitude. There are virtually no inscriptions on the precisely-cut stones. This absence of inscriptions is odd. One finds the same lack of inscriptions on the oldest sites in Egypt. Author John Anthony West has pointed out that some of the great monuments of Egypt – the Great Pyramid, the Sphinx and the nearby Sphinx temple, and the Osiris Temple at Abydos – appear to be many thousands of years older than the Egyptian fourth dynasty – and that, remarkably, they also do not bear inscriptions – a stark contrast to the other Egyptian tombs and temples in which every available inch tends to be filled with images and hieroglyphs. Who built this extraordinary site, Puma Punko? Who built it, when, and for what purpose? No one knows. Ancient alien enthusiasts, predictably, attribute its building to ancient aliens. Others say it was constructed by very technologically advanced ancient humans – more advanced than ourselves, and that human civilization has been devolving, not evolving, since that time. Still others suggest that the ancient aliens and the ancient humans were one and the same, and that our species originally came from the stars. Others assure us that there is certainly no mystery at all, and that it is all easily explainable, though they do not have the exact explanation just yet. And others just laugh. Whoever the builders were, what does seem indisputable is that there is a piece missing in our view of history. There are some things we cannot account for. Pumapunko is not the only mysterious megalithic site. The entire globe is peppered with them, and for the most part, we have no satisfactory explanation to account for them. Pumapunko is one of the strangest of all, but the more one looks at the others, the more puzzled one becomes. Archeologists struggle to explain how theses enormous megalithic structures could have been built using the primitive tools and the limited knowledge that we attribute to early peoples. When the history of our species is missing giant gaps, as it seems to be, we need to acknowledge that there is much that we do not know. The history of our world is filled with mysteries that we have not yet even begun to understand. To see Sharon St Joan’s ebook, Glimpses of Kanchi, click here. To view Brien Foerster’s video of Pumapunko, click here. Top photo: Janikorpi / Wikimedia Commons / “This file is licensed under the Creative Commons Attribution-Share Alike 3.0 Unported license.” / A view of some of the stone blocks at Pumapunko. Second photo: Photo: Brattarb / Wikimedia Commons / “This file is licensed under the Creative Commons Attribution-Share Alike 3.0 Unported license.” / One of the enigmatic stones at Pumapunko. Third photo: Mattcorbitt / Wikimedia Commons / “This work has been released into the public domain by its author, Mattcorbitt. This applies worldwide.” / A stone with a precise straight line and machined holes within the line. Fourth photo: Brattarb / Wikimedia Commons / “This file is licensed under the Creative Commons Attribution-Share Alike 3.0 Unported license.” / More precisely cut stones. Weathering has broken some of the corners. Just a few years ago, an amazing complex of structures was discovered in eastern Turkey. Known as Gobekli Tepe, these are about twenty stone circles – not formed of rough-hewn stone, like Stonehenge, but formed of straight, precisely cut and polished stone columns, with lintels across the top, decorated with animal sculptures. These have been dated to around 12,000 years ago – thousands of years earlier than any previously known complex of carved structures. They were apparently covered up by earth a couple of thousand years after they were created. One can only suppose they were sacred sites and when the people were compelled to leave them, for whatever reason, they covered them up in order to preserve them to avoid having them deteriorate and fall apart over time. The time that they were created, around 10,000 BC, coincides with the ending of the last Ice Age. Gobekli Tepe is written about extensively in the book, Forgotten Civilization, by Robert Schoch, a geologist who gained international renown (and some measure of ridicule) for his work with John Anthony West, related to the Sphinx in Egypt, and the hypothesis that the Sphinx is much, much older, by thousands of years, than previously thought. Graham Hancock, another well-known exponent of the concept that there was a high civilization, unknown to us, in the extremely remote past, examines this in his book Underworld, which looks at a number of sites, now underwater, which are evidence of very ancient, unknown civilizations. His theory is that, because it is an accepted scientific fact that sea levels rose dramatically when the ice melted at the end of the last Ice Age, that the remains of ancient civilizations, which would have been located on what was then the coast, would now be entirely under the sea, often many meters below the surface. Many of these sites have been found and Graham Hancock has dived some of them – at the island of Malta, Yonaguni which is off the southern coasts of Japan, Dwarka and other sunken cities off the coasts of India. At these and other underwater sites, there are very extensive remains of ancient megalithic structures. There is growing interest in this concept of lost civilizations – really of a lost history of the world – and an increasing number of writers who investigate this topic. It is also covered in the TV series, Ancient Aliens. Ancient Aliens leaves itself open to a certain level of ridicule by proposing that really just about everything in the distant past must have been built by ancient aliens who sailed to the planet earth in UFO’s. This can strain the credibility even of those who have no problem at all believing in either UFO’s or very ancient civilizations. However, the series does an excellent job of covering a great many really fascinating archeological sites of extreme antiquity, and is very much worth watching solely for the footage of these sites – if one isn’t too much put off be the assumption that ET himself must have built every single pyramid and every ancient ruin. A new series on the H2 Channel is America Unearthed, in which the forensic geologist, Scott Wolter, travels across the U.S. looking into ancient sites on the American continent which indicate that America was discovered, not just by Columbus, and not just by the Vikings around 1,000 AD, as nearly everyone now accepts, but by many peoples from all corners of the world over many thousands of years. For example, on Great Isle, on Lake Superior, there have been dug around 5,000 pits, used for extracting copper – one of these was dated to 3,700 BC. The dating was done of cut and shaped timbers that were in place in one of the pits, supporting a large piece of copper. A stone containing carved letters was found, and these turned out to be the letters of the Minoan script – the Minoans lived on the island of Crete, where, around 3,000 BC and earlier, they had a great need to mine copper to provide metal for the Bronze Age. Perhaps they sailed all the way to the Great Lakes, and mined the copper that they found there to fuel the Bronze Age. It seems increasingly clear that history, as we have been taught it, is simply not true. It is woefully incomplete, and there are vast chapters of the ancient past that are only just beginning to come to light. Great civilizations, unknown to us, may have extended for millennia back into the mists of time, perhaps other great worldwide civilizations from tens of thousands of years ago – or hundreds of thousands – or who knows? Perhaps galactic civilizations lasting over billions of years? If that’s too far-fetched, don’t worry – it was just a fleeting thought. Even the sites now found from only a few thousand years farther back into the past will be sufficient to radically alter our view of history. The well-settled world which we thought we knew fifty or sixty years ago – with its carefully defined boundaries and its nicely stable limitations – is not true. The walls are falling down – all the preconceived notions – of history, of assumptions about the nature of the physical universe, about “reality” – all these are being upended. This, if you like, is “the end of the world.” It is the end of our tidy, finite, limited conceptualization of the world. Concerning physics, it is the end of the Newtonian world. Concerning history and archaeology, it is the end of history as we have known it. It is, simply, the end of our human-imposed boundaries. With string theories and multiple universes, ancient unsuspected high civilizations, with aliens of all sorts, ancient and modern – with everything that we could not previously have imagined, the world we had grown accustomed to has come to a close, the walls have come tumbling down, and a vast multi-verse of unfathomable, mystic realms — of myth and magic — awaits us. 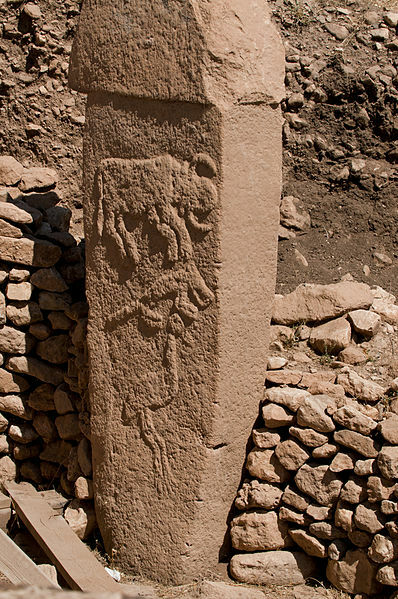 Top photo: Author: Teomancimit / Wikimedia Commons / “This file is licensed under the Creative Commons Attribution-Share Alike 3.0 Unported license.” / One of the carved columns at Gobekli Tepe. 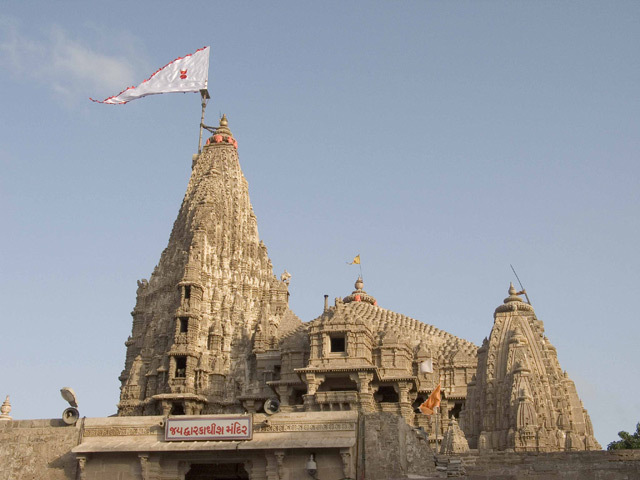 Second photo: Author: Scalebelow / Wikimedia Commons / “This file is licensed under the Creative Commons Attribution-Share Alike 3.0 Unported license.” / The Dwarakadheesh temple (Dwarakadhish temple/Dwarkadhish temple) at Dwarka, Gujarat, India. The temple is thought to have been constructed on top of Lord Krishna’s original residential palace, by his grandson, Vajranabha. 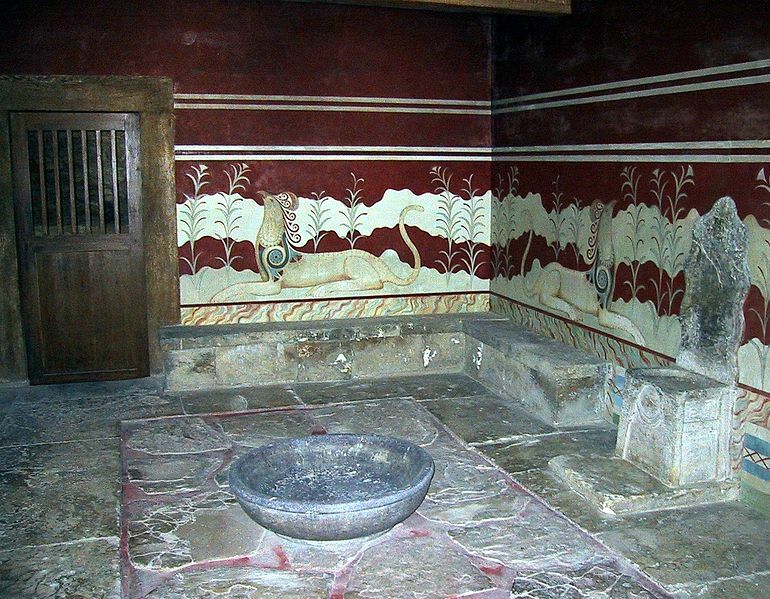 Third photo: Author: Chris 73 / Wikimedia Commons /”This file is licensed under the Creative Commons Attribution-Share Alike 3.0 Unported license.” / The throne room at the Minoan palace of Knossus on Crete. To watch the full episode of America Unearthed, “Great Lakes Copper Heist”, click here.